Not taking the time to educate themselves especially since the industry is constantly changing (like Panda updates and Penguin updates). Always taking shortcuts and are doing “black hat” or dark “grey hat” techniques. “Tech talking” over the heads of clients and pushing only their agendas. Not understanding their clients’ needs like ROI, P&L’s, hard cost per acquisition, and company goals. Not setting proper expectations for their clients. The results of using such practices has led to unhappy clients, clients websites being penalized, websites being taken down, business closing their doors, and clients losing trust in our industry. How is IBI Marketing different? Total transparency- The monthly reports given will show everything (that isn’t proprietary) therefore holding IBI Marketing accountable for every ounce of work performed. This will show all the bad and good and how IBI can improve each month. Faith Based- Many of the employees, associates, and the CEO are Christians. Following the lead of their CEO, IBI Marketing always attempts to act in a manner of good faith. Although we don’t push our faith on our employees, associates, and clients many have stated they feel the “goodness” that is being done. Team work- We usually have a team of people that work on a client’s account per each platform. Most firms usually have only one individual which doesn’t allow for different strategies or ideas to be conceived. One stop shop- No need to go anywhere else because everything can be done at IBI. Get a website designed and drive relevant traffic to get the customers desired. IBI Marketing offers SEO (Search Engine Optimization), PPC (Pay Per Click), SMM (Social Media Marketing), Consulting, and Website designed. No contracts- To prove their worth, IBI will show results and work every month. At any time IBI can be fired. This is a risk because due to their affordable prices, profitability comes with retaining a client for a long period of time. Most lenders have at least 6-12 month contracts at premium pricing. *Contracts are offered on a case by case basis. Google Certified/Google Partner- IBI Marketing is a Google Certified Company. Per a Google representative as of 7/2013 less than 1% of all individuals doing SEM are Google Certified. Being certified you must take at least 2 extremely long and rigorous tests on Googles best practices and MOA. You must take the test annually to remain updated. *This is not a requirement of SEM firms. IBI does it to be as knowledgeable as possible and pass it on to its clients. Education, test, and requirements to be a Google certified partner can change from year to year. Startups and Non-Profits-IBI Marketing has a strong desire to help startups and nonprofits. Due to the small profit margins and the work involved it is understandable why most firms don’t do business with these types of companies. With the humble beginnings of IBI’s CEO, he has a desire to consult and design programs to help startups and non-profit organizations. IBI Marketing provides “Nordstrom like product and service at Wal-Mart type prices”. 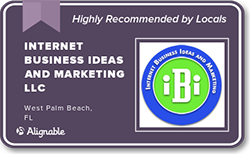 Experience and bandwidth- IBI Marketing has over 50 years of marketing experience with educational institutions of higher learning, Fortune 500, non-profits, and start-ups companies. Offer business ideas and marketing solutions to new companies, established corporations, and non-profits. Have a positive impact on every client that is in our sphere of influence. All this will be accomplished through a strong sense of faith and obligation to assist others in accomplishing their goals. What does this mean to a company/organization? You can trust IBI Marketing. Like any relationship trust plays an important role. IBI being open and vulnerable puts everything out on the table. Proper expectations will be set on behalf of both parties. You are getting a well-educated and knowledgeable company concerning SEM guidelines and cutting edge optimization techniques. IBI is a professional and faith based company and a client can feel they are treated with the utmost respect while achieving the goals they desire. These things mentioned in this blog/article may be seem simple but you will be surprised how many SEM firms don’t do this. IBI Marketing does the above mentioned as part of their core competency.